I had tanned myself into "scary status", but Dave worked at a tanning salon (seriously.... his aunt and uncle owned one!) and so it was kind of par for the course. In hindsight I wouldn't change my hair or dress or anything like that - but wish I had known a little bit more about how bad the tanning bed was for me! My dress had these little chiffon tails (anyone else sport this style in 2001?) and loved my hair ;) We took my dad's BMW and thought we were hot stuff. My Senior year Dave came back as my date (we had 4 or 5 girls who had older dates so he wasn't the only one who came back after graduation) and I ADORED my dress. ADORED!!! I saved and saved and then saved some more and custom ordered this pistachio raw silk gown from the store that I worked at downtown McKinney. It was two pieces and laced up the back and I was obsessed. 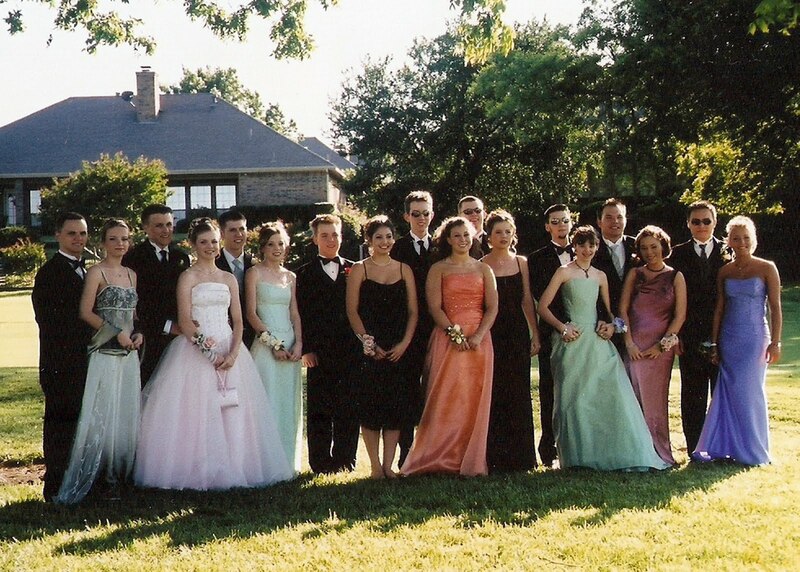 And a random story - it was the only formal dress I held onto and when my parents moved out of the house they had lived in while I was in high school my mom made me take it and I actually ended up giving it to a girl who wore it to her Prom and loved it just as much as I did. 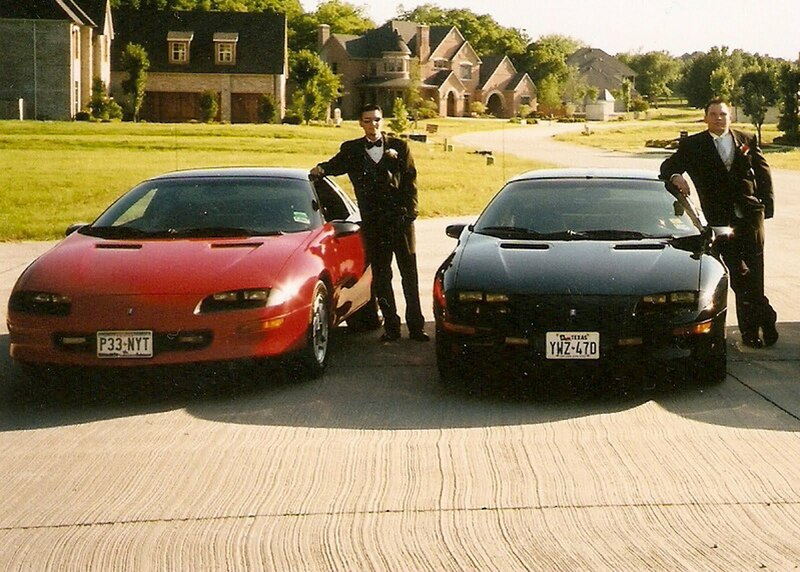 This year Dave had his own "cool" car to drive to Prom :) Y'all... that car was SO LOUD! 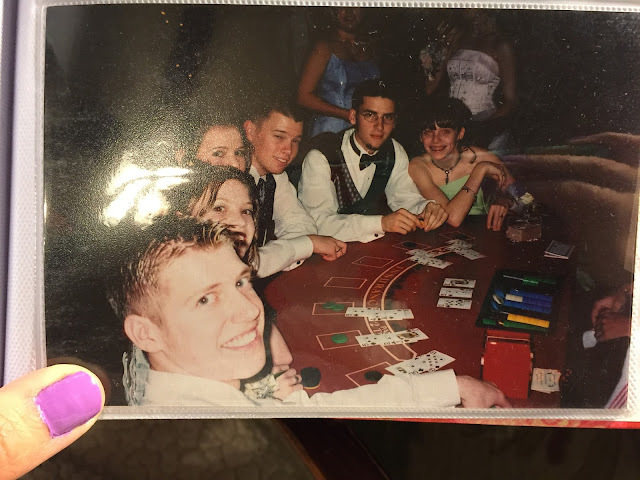 We went to a HUGE high school (I think my graduating class was either 700 or 750) and if you got to Prom late the dance floor was PACKED and so we ended up spending a big chunk of our time that year at the gambling tables. Yes... gambling tables. :) They gave each person a set number of chips and then the chips that you ended up with at the end of the night translated to raffle tickets. I always had a great time at PROM - but the most fun parts for me were always getting dressed up and going out to eat and then the after party :) My parents always offered to host and made sure that we had so much fun after prom with tons of food, a heated pool, etc. 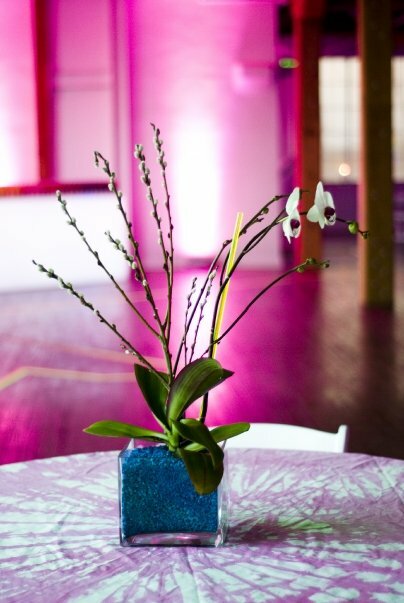 We went with a neon kind of theme with tons of uplighting, custom tie-dyed table clothes and orchids potted in colored rocks. 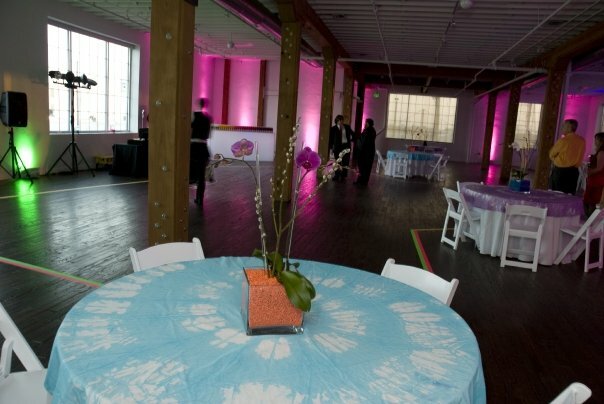 It was in a loft downtown Dallas with amazing windows and views and was amazing once the sun set. 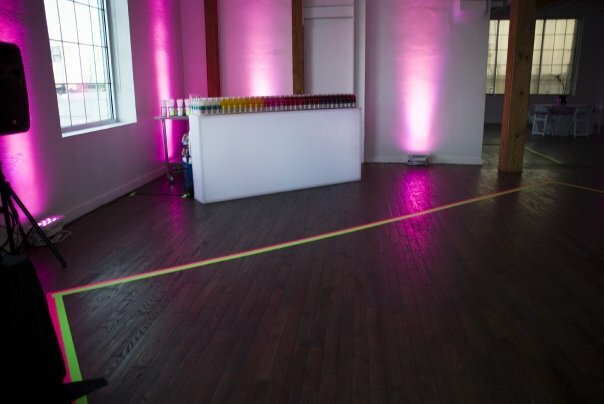 We had a vitamin water bar and the dance floor was taped off with reflective neon tape. 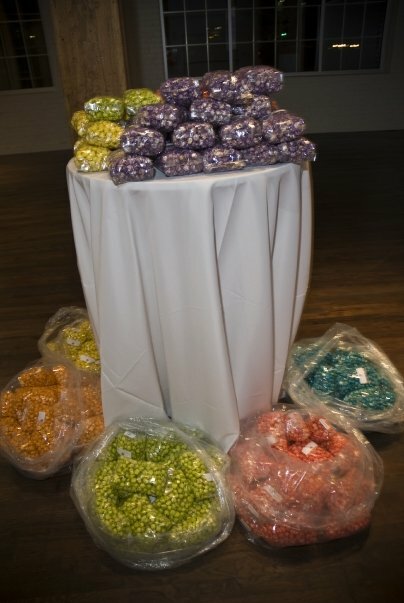 And how fun is this... to execute our vision I hired a FANTASTIC florist/event designer and she and I have actually connected via social media in the past few years. Isn't she darling??? This was her passing out signature drinks at Prom 2009, but she blogs now HERE. So... there you have it! 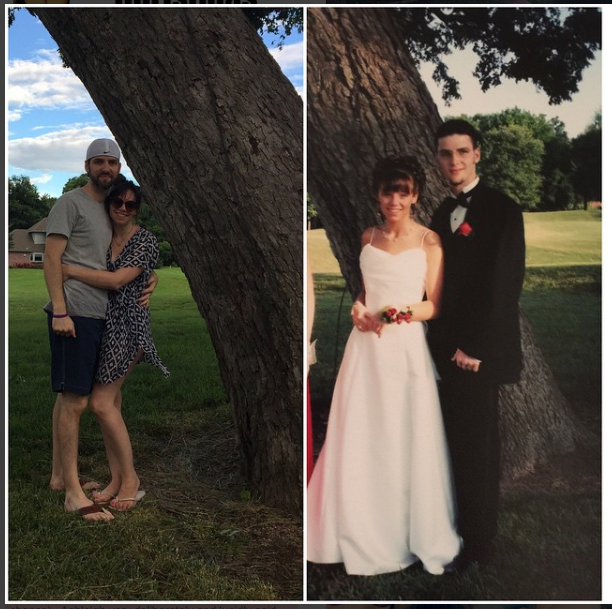 A little walk down Prom memory lane. Link up and share your Prom posts below OR if you don't blog tell me about your Prom(s) in the comment section. How fun is it that Dave was your date?! I loved seeing these!! Dave's car was RAD, but not as RAD as your tan. :) Love the pics!!!! 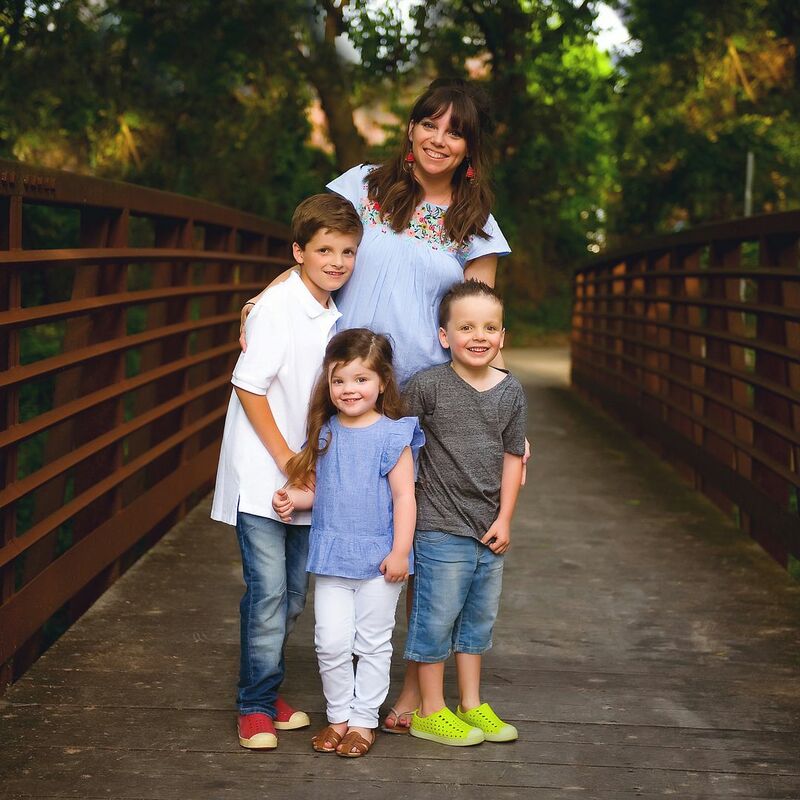 Cute, cute pictures!!! Love it all! Such a fun idea! I remember having to ask my dad to sign a release at the tanning salon so I could tan before prom. Oh what I wouldn't do to tell my young self to STEP AWAY FROM THE TANNING BED! 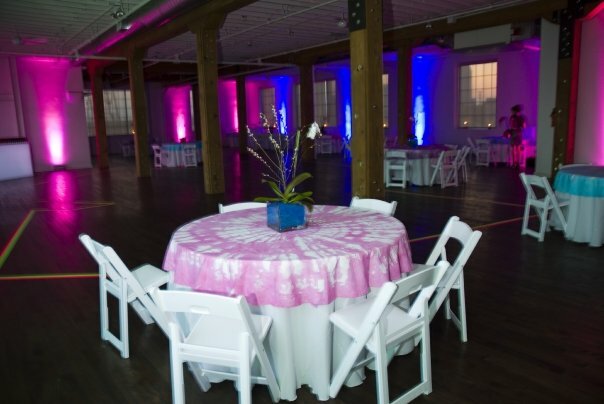 I love all of this and the neon prom is so cute! I wish I had seen that pic with the vitamin water bar before last year's 5th grade banquet for our oldest. 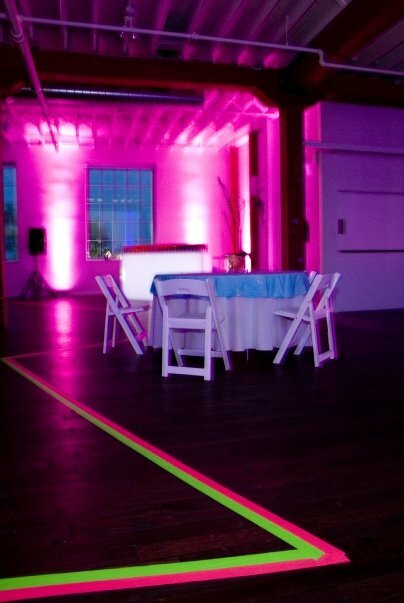 We did a neon theme too and that would have been the perfect addition-so fun! I also LOVED my senior prom dress - even if it was a romper. It's hanging in my closet and I will never ever be able to fit in it again! Ha! I am cracking up! I feel like we were all such babies!! So fun!! I cannot believe how tan you were for your junior prom!! I totally would have been the same way though if my boyfriends family owned a tanning salon. Loved looking at these old pics! This was so fun! Love a good walk down memory lane! And the prom you planned looked amazing. 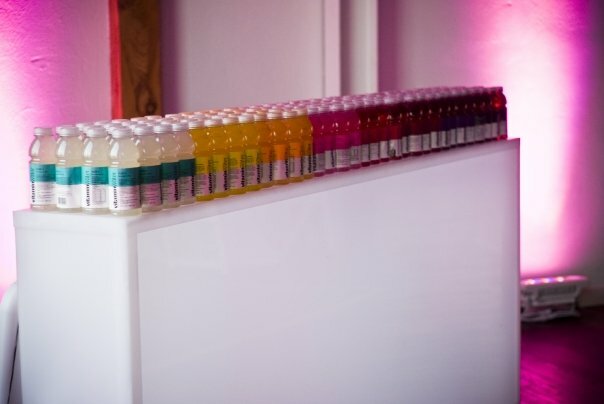 A vitamin water bar is brilliant.